THis is the home page of the Leith Local History Society. Find out more about the history of Leith, Scotland (now part of Edinburgh) and about our Society. 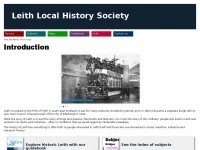 The websites creator or author is Content - Leith Local History Society, web design - David King.